Young plants of gorse have a trifoliate leaf (divided into three sections) but as the plant matures the leaves are invariably green, furrowed stiff spines. Flowers may be present at almost any time of the year but April to June are typical months for flowering. The flowers are scented (variously described as smelling of almonds or coconuts) and are a rich, golden yellow. The flowers are about 2 cm in width. When bees alight on the lower lips (keel) of the flower , these petals are depressed and the stamens release their pollen onto the body of the insect. 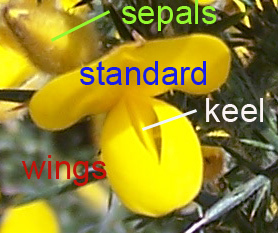 The big petal at the back of the flower is called the standard, and the two smaller ones to the side are the wings. The sepals (calyx) are also yellow. Seeds pods are hairy and black (when dry) - they open 'explosively" on hot, dry days dispersing the seeds. 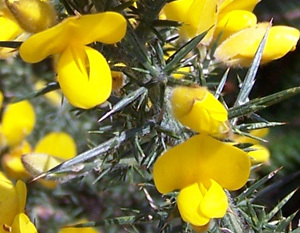 Gorse or Ulex europaeus is a spiny, evergreen shrub. It can grow to a height of some 2 metres (+). May form impenetrable clumps. 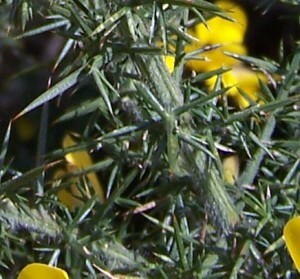 It is found throughout the British Isles - except for at high altitudes, and not in the Fens. Its distribution through the U.K. may be seen here. 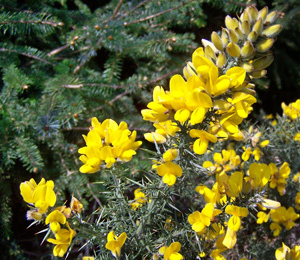 Tends to favour acid soils, grows in grasslands, open woodlands, and heathland. 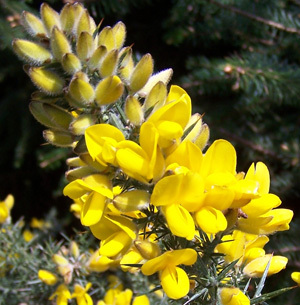 Also known as Furze and Whin.